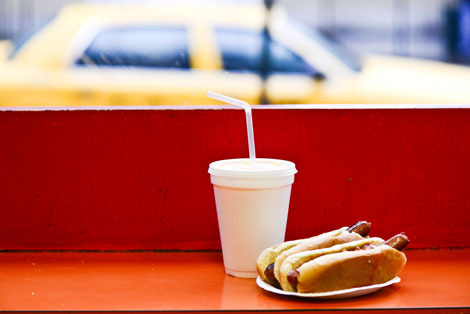 The iconic hot-dog joint—down to just one location after the shuttering of its Sixth Avenue outpost—remains a crossroads for New Yorkers of all stripes. Last week, word that the West Village location of Gray’s Papaya has shuttered spread like wildfire throughout the city. Outrage was the default response, and not just because it had been there for so long, or because the closure left the city with just one remaining location of the all-hours hot-dog haunt—there was also the knife-twisting news that it will be replaced by a juice bar. Gone are the funky, chalky tropical concoctions in styrofoam cups, the snappy dogs, the red standing counter, and the blaring local radio; now, kale juice marks the spot. As the dust settles, it’s clear that the loss of Gray’s is just another case of not knowing what we had until it was gone. Gray’s Papaya never really got the level of reverence that New York’s vaunted pizza joints or centuries-old bars routinely receive—not until the lights had been turned off, at least. Let’s not get caught slacking again—Gray’s lives on uptown at 72nd and Broadway, and if you like hot dogs and New York, you should make it your business to pay homage from time to time. And when you do, you’ll remember that the place isn’t just about the dirt-cheap franks. It’s also about the people who go at all hours, and how they take their hot dogs, and the bizarre things they’ve seen, and the way this quirky, unfussy place defines some vital aspect of their New York lives. Click through the slide show to see the faces of the last remaining Gray’s Papaya. Photos by Liz Barclay. Interviews by Josh Kaplan. Where are you from? Victoria, British Columbia, but I've lived here for six year. I've heard you're a New Yorker when you've cried in public, and I've definitely done that a lot, so I feel like I've earned my stripes. How long have been coming to this location? My school dorms when I moved to New York were about six blocks away, so six years, but I come less frequently now. When do you usually come? Breakfast. Do you have a go-to order? My favorite thing at Gray's Papaya is not the hot dogs, it's the breakfast sandwiches. They make breakfast sandwiches, you can come in and get them on a croissant, like ham, egg, and cheese, and they just fry them on the griddle. How do you take your dog? I usually get ketchup—or ketchup, mustard, and onions—depending on how willing I am to have bad breath for the rest of the day. Drink or no drink? Right now Diet Coke, so I can wake up, but I love the papaya drink as well. I just needed the caffeine. Any funny or memorable Gray's stories? It's not really original, just a lot of drunken nights when this was the only place open and, you know, you kind of stumble home and you think, "Let's get way too many hot dogs." Where are you from? Long Island. How long have been coming to this location? 10 years. When do you usually come? I take dance class, right here at Steps, and this is usually my reward after class. Do you have a go-to order? Two hot dogs with ketchup and relish. Drink or no drink? Pineapple juice, which is extra but it's worth it. Any funny or memorable Gray's stories? I don't have any specific stories, but when you come here on a Friday or Saturday night, just watching all of the outfits and the people who are going out for dinner, or going out to a bar or whatever...you know, bridge and tunnel and New Yorkers and old people and young people. Just a nice slice of life that goes by. Where are you from? I've been here a long time. How long have been coming to this location? I've been in New York for over 30 years, so... When do you usually come? Lunch. Do you have a go-to order? Two dogs with mustard and sauerkraut. Drink or no drink? Papaya drink. Any funny or memorable Gray's stories? No, but you always see a cast of characters here. And there's always tourists here, they don't know what the hell to do. And you think, "Okay, let's move it. Just go home." It's great, and I'm really pissed off about the one on Sixth Avenue. Where are you from? Brownsville. How long have been coming to this location? Over 30 years. When do you usually come? In the evening. Do you have a go-to order? Hot dog with mustard, sauerkraut, and onion. Drink or no drink? Piña colada. Any funny or memorable Gray's stories? I remember when they were 50 cents. I was in the area—I haven't been here in a while. I'm here with my sister and my niece, and I said, "I'm going to Gray's." But I didn't know what the price was going to be. Where are you from? East Village. How long have been coming to this location? My whole life. My dad was a cop, and he knew where to eat, and he'd take me here. When do you usually come? Whenever I'm in the mood for a hot dog, usually once or twice a week. Do you have a go-to order? A hot dog with mustard and kraut. Drink or no drink? Papaya. Any funny or memorable Gray's stories? It's just a comfort. I come and I leave. It's part of my life. Usually, I'm here for eight minutes and I'm on my way. Where are you from? Northeast Jersey. How long have been coming to this location? This is my second time. Do you have a go-to order? Single dog. How do you take your dog? Whatever is cheapest on top. Drink or no drink? No. Any funny or memorable Gray's stories? Well, I have a lot of guilt associated with eating unhealthy things, but I walk past all the time and I finally had to walk in. Where are you from? Cuba. I'm Greek Cuban, but at this moment, I'm Cuban How long have been coming to this location? Once a week for about a year now. When do you usually come? Lunch. Do you have a go-to order? Two hot dogs with sauerkraut, onions, mustard. Drink or no drink? Coke. Any funny or memorable Gray's stories? Yes [gestures towards photographer]. She's beautiful. Where are you from? Jamaica. How long have been coming to this location? First time—I just moved here. How do you take your dog? Onions and mustard. Drink or no drink? Hot chocolate. Any funny or memorable Gray's stories? My husband told me about this place because he's been coming here for years. Where are you from? Williamsburg projects. How long have been coming to this location? 35 years, maybe? When do you usually come? All times. Now, only when I'm in the area, but I used to bartend so I'd come in late night. I was never one of those breakfast guys. Do you have a go-to order? Two dogs. How do you take your dog? Naked, just mustard. Drink or no drink? Grape soda. Any funny or memorable Gray's stories? No, not really. It's always been a very predictable, reliable quality bargain. I do remember coming in and getting the "revolution" hot dog for a quarter, way back when, so you know there's been inflation. But it's pretty much the same. Matter of fact, I have a son, a 20 year old—he comes here now and he's totally into it. Where are you from? Manhattan, near Columbia University. How long have been coming to this location? 8 years. When do you usually come? Lunch. Do you have a go-to order? A frank with chili and onions. Drink or no drink? Water. 'Cause I'm training. Where are you from? Korea. How long have been coming to this location? This is my first time. Do you have a go-to order? Hot dog with onions and sauerkraut. Drink or no drink? Cranberry Snapple. Where are you from? Malaysia. How long have been coming to this location? 10 years. When do you usually come? Lunch. Do you have a go-to order? Hot dog. How do you take your dog? Onions, mustard, and ketchup. Drink or no drink? No drink. Where are you from? Korea. How long have been coming to this location? This is my first time. Do you have a go-to order? I got the lunch special. How do you take your dog? Relish and onions. Drink or no drink? Papaya. Where are you from? San Francisco. How long have been coming to this location? First time. Do you have a go-to order? Lunch special. How do you take your dog? One cheese and chili, one chili with relish and ketchup. Drink or no drink? Coke. Where are you from? South Africa. How long have been coming to this location? First time. Do you have a go-to order? Lunch special. How do you take your dog? Mustard, onions, and ketchup. Drink or no drink? Papaya. Where are you from? New Zealand. How long have been coming to this location? First time. Do you have a go-to order? Lunch special. How do you take your dog? Mustard, onions, and ketchup. Drink or no drink? Papaya. Where are you from? Boston. How long have been coming to this location? Since 1982. When do you usually come? Weekends. Do you have a go-to order? A dog with mustard. Drink or no drink? No drink. Any funny or memorable Gray's stories? Just people watching. Where are you from? St. Lucia. How long have been coming to this location? Like a year now. When do you usually come? Around this time [lunch], after work. Do you have a go-to order? Sometimes a hot dog, sometimes just a drink. How do you take your dog? With onions...actually, I ask them for a little of everything. Drink or no drink? Ginger ale. Any funny or memorable Gray's stories? Whenever I come, the guys are great. I get a hot dog right away. I don't always come here, but once in a while, I treat myself. Where are you from? Tennessee. How long have been coming to this location? Maybe like 15 years. When do you usually come? For lunch. Do you have a go-to order? Two dogs with sauerkraut. Any funny or memorable Gray's stories? (Laughing) Yeah. They used to be cheap. Where are you from? Bronx, New York. How long have been coming to this location? 4 years. When do you usually come? During lunch. Do you have a go-to order? Hot dog with ketchup and cheese. Drink or no drink? Nope. Where are you from? South Korea. How long have been coming to this location? About a month. When do you usually come? Usually for lunch. Do you have a go-to order? Two hot dogs: one with cheese, one with onions, both with ketchup and mustard. Drink or no drink? Either papaya or orange. Where are you from? L.A. How long have been coming to this location? 5 years. When do you usually come? When I need a quick bite. Do you have a go-to order? Two dogs with onions and mustard. Drink or no drink? Diet Coke. Any funny or memorable Gray's stories? No. I just had heard about it years ago, so when I came out here I had to try it out. Best hot dog in New York.